Ben Jordan was born and raised in the American Southwest. He earned a bachelors degree in Sociology at Northern Arizona University before discovering a passion for clay in 2006. After completing a Bachelors of Fine Art in ceramics at Northern Arizona University he went on to work and apprentice in the city of Groningen, in the Netherlands. 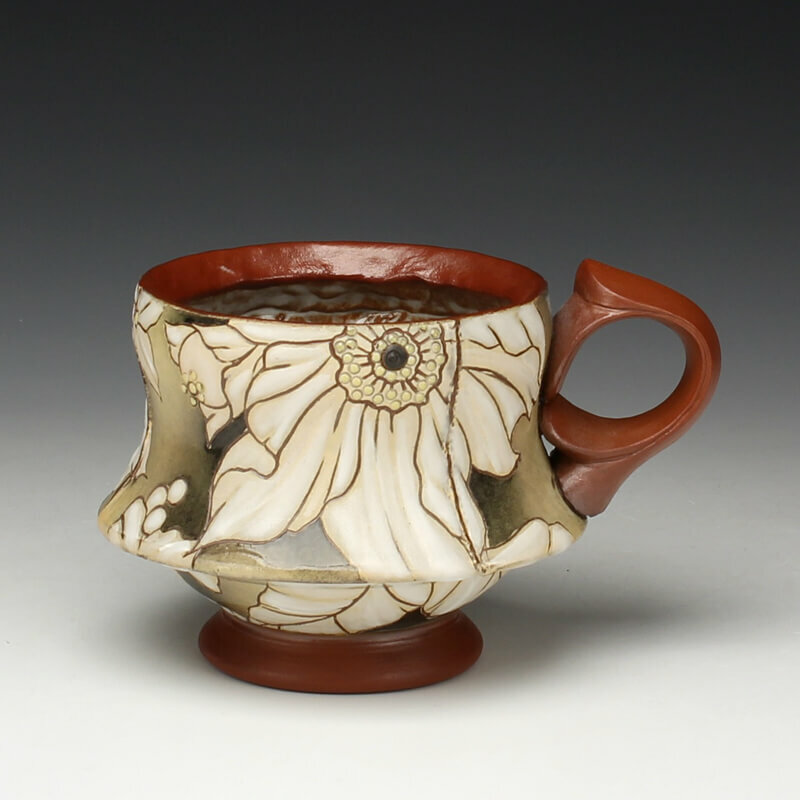 After finishing a residency at the Red Lodge Clay Center in 2014, he went on to obtain his Masters in Fine Art in ceramics from Virginia Commonwealth University. After graduate school Ben completed a year long ceramics residency at Pocosin Arts in North Carolina and is Currently a long term resident at The Clay Studio of Missoula. I view a single mug or a single bowl as a sculptural object, one that comes with certain parameters and guidelines within the context of utility. Parameters that I can choose to work within or choose to ignore. In each piece, the time, energy and attention that I put into it is conveyed through the ornate surface treatment and detail of the object. This helps me to visually and physically convey to the user the preciousness, importance, and connection that I feel towards each piece that I make and share. My current body of work is in part an exploration of the interplay between form and surface ornamentation. I enjoy the sometimes competing, sometimes harmonious relationship between the two. I’m endlessly interested in the way surface decoration can enhance and reinforce the subtle nuances of a form, highlighting a specific curve, profile, or process. While at other times the surface treatment can completely take the limelight, overshadowing the form by the surface’s design, pattern and color. I especially enjoy seeking the space between these at times, disparaging ends of the spectrum, finding a “happy medium” where form and surface are simultaneously highlighting each other and vying for attention. The inherent dialogue that the tradition of functional ceramics embodies is a unique and humbling attribute that is also at the heart of my work. Conversations about community, domestic space and daily ritual are important to my life and by utilizing functional ceramics I am able to instill and share that importance through my utilitarian objects.